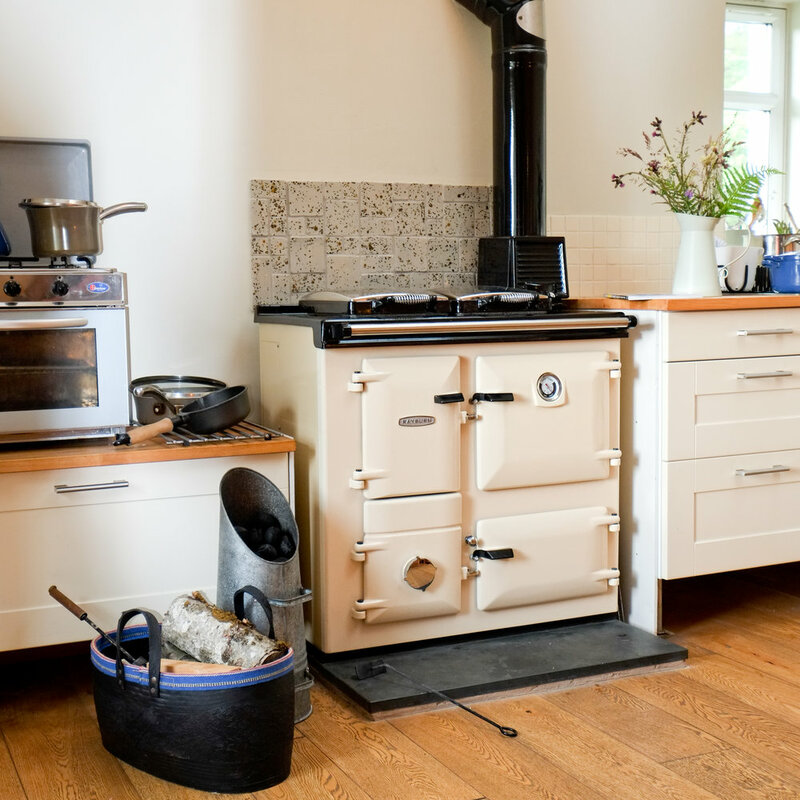 So whether you're looking to recreate the traditional feel of life in the country, design an exciting modern kitchen with an “urban look” or simply enjoy the pleasures of authentic range cooking with the convenience of combined hot water and /or central heating - you're sure to be at home with a Rayburn. The Rayburn Cookmaster is an authentic cast iron range cooker benefiting from indirect heat technology. This is called 'kind-to-food' heat, because rather than allowing food to dry out, it seals in the flavours and natural juices, creating healthier, more delicious dishes. So, whether you're fearlessly creative in the kitchen and like to act-on-impulse or prefer to follow your recipes to the letter, with a Rayburn range cooker you'll find it easier to get perfect results time after time. The Cookmaster's strength is its versatility. A compact model that's perfectly at home in any kitchen. With all the power and efficiency you would expect from a Rayburn, in a compact size, the Cookmaster 200 is ideal for smaller kitchens. Featuring a large main oven with either a second cooking oven or warming oven depending on fuel type, the 200 series is perfect for succulent roasts, real home baking and the complete range of contemporary cuisine. Fuel option: Solid Fuel and Woodburning only. Freedom to choose installation with or without a chimney. Compatible with the standard height and depth of kitchen worktops and wider than the 200 and 300 series models, this is the largest Cookmaster model. A cast iron lower oven operates at half the temperature of the main oven. The range also features an integral automatic timer - plus the option of an external programmer. A 400 Series Rayburn can either be flued through a suitable chimney or the powerflue model allows the cooker to be installed virtually anywhere. Fuel option: Oil only. Cast iron cooking excellence with the versatility of on/off control. Digital controls utilise software that accurately monitors all critical temperatures. This means the performance is more efficient as the burners are switched on and off to suit requirements. Continuous thermostatic monitoring of oven temperatures for consistent cooking and faster warm up times. Gentle warmth to your kitchen due to use of latest insulation materials. Fuel Option: Oil only. All the flexibility, all the choice. The Rayburn Heatranger is supremely versatile. There's a choice of models, each of which delivers superb range cooking performance along with different heat output options for hot water and central heating. There's a model for every home, from the largest to the smallest. You can choose a model that provides central heating with domestic hot water, or one which simply heats water. Some are designed to fit within worktop height; others can be standalone or set on a plinth. Some models are thermostatically controlled to automatically maintain a constant temperature. The Heatranger 200 Series has all the cooking benefits of the Cookmaster 200, with the added benefit of Hot Water and Central Heating production with the capability of heating up to 2-3 radiators. Fuel options: Smokeless Fuel, Wood and Peat briquettes. The Heatranger 300 Series has all the cooking benefits of the Cookmaster 300, with the added benefit of Hot Water and Central Heating production with the capability of heating up to 8 radiators. Fuel options: Smokeless Fuel, Wood and Peat briquettes. The Heatranger 400 Series has all the cooking benefits of the Cookmaster 400, with the added benefits of fully programmable Hot Water and Central Heating production with some models capable of heating up to 20 radiators. There is also an industry leading Condensing model available for those that have the option to choose gas. Fuel options are Oil and Gas. Beneath the classically beautiful exterior of the Rayburn 600 lies a highly-efficient combined heating and cooking system that creates mouth-watering dishes, a wonderfully warm home and piping hot water, just when you need it. Fuel Option: Oil only. Rayburn 600 models have a large cast iron hotplate with enough space to accommodate 8 saucepans. Cooks will also love the main oven (a full 16% larger than other smaller Rayburn models), with it's unrivalled four heat zones, which mean it is perfect for grilling, roasting, baking and simmering. Plus, it has a 34 litre capacity lower oven that produces an even, radiant heat at approximately half the temperature of the main oven - ideal for casseroles, steamed root vegetables and puddings. Advanced digital controls also allow you to programme your cooker to come on automatically when you are out, so it is always ready when you need it. The Rayburn 600 is capable of heating up to 20 radiators and is compatible with all modern heating systems. It's intelligent Eco-mode setting encourages fuel efficiency and energy savings and it also benefits from two fully automatic burners that allow you to control hot water and heating independently from the cooker. Plus with 'A' rated condensing boiler models available, the Rayburn 600 Series offers you a truly flexible and efficient solution to all your cooking and heating requirements.